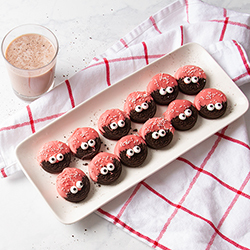 Make these Lovebug cookies for the perfect family treat! Celebrate Valentines Day with these adorable and delicious dipped cookies to share with all of your loved ones. Start this family fun activity by lining a baking sheet with parchment paper and set aside. Melt chocolate in a microwave safe bowl until softened. Mix in red food coloring until you reach the color you like. Take your sandwich cookies, and dip about halfway in. Coat both sides if possible. Lay dipped cookies onto baking sheet. Sprinkle dipped cookies with sprinkles of your choice. Then add the candy eyeballs by using the leftover chocolate as glue. Leave cookies to set and chocolate to harden. Put it in the freezer to speed up the process.